Some delectable homemade hamburger buns that recently graced our table. It is the foundation of civilization, isn't it? I mean, it has been the most basic staple of our diet for so very long. Bread is comforting, it is cozy, it is that sense of coming home. Yes, many of us have cut back on our bread intake, have set it aside in favour of a diet higher in whole foods, or have even abandoned bread entirely and replaced it with a gluten free or maybe paleo diet. This blog is going to celebrate bread. It is also going to celebrate whole living - enjoying life to the fullest while taking care of our bodies so that we may continue to enjoy our lives. I've come to a great realization over the past years, and that is the need for balance. A balanced approach to life gives us the freedom to enjoy good food, because that balance leads us to not abuse anything. In a "white-bread" society, we certainly know that too much of any one thing is not healthy. In a first-world that is struggling with obesity while others starve, we are very conscious of the need for balance. My blogging up to this point has been un-balanced, but in the other direction. I've restricted and I've counted calories, I've stressed over everything I put in my mouth and everything I haven't eaten when I perceive I should have eaten it. And some time around the first week of January, when I was lying awake trying to shove my stress into the background, I realized that this needed to change. What I really crave is a healthy life. A healthy body, certainly, but also a healthy mind, a healthy spirit, and a healthy lifestyle. What is health? Webster's Dictionary defines health as the condition of being sound in body, mind, or spirit. I want to create those ideal conditions for myself. And in this blog, this haven of peace, I want to promote health in a positive way. So no more berating myself for a "failure", no more nit-picking over every calorie (I've got other ways to worry about that, like caloriecount.com.) And no more giving up, because this is a way of life. I am a whole person, and I need to live as if all of my elements are fully integrated. So, I am leaving behind When Winning = Losing, because even just the title is a reminder of stress and failure. The content of that blog did too much to make everything a competition, to always remind me to compare myself to the world, instead of comparing myself to myself. I now choose to Embrace the Plate, and I invite you to join me. This is probably the best dinner roll recipe we've found. Soft as clouds, buttery and just the right flakiness. Melt in your mouth amazing. Make the same way you make other bread, be it in the bread machine with the dough cycle, or by hand. After punching down, form into 12-15 balls and allow to rise in a 9x13 pan until doubled. Bake in a 350° oven about 12-15 minutes until golden brown. 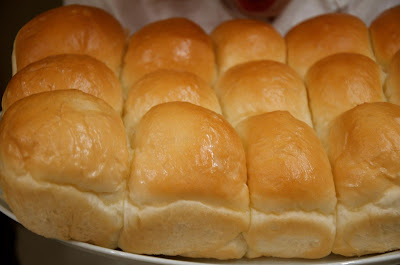 After removing from the oven, brush the tops of the rolls with melted butter.